Aunt Marian lived the first 45 years of her life in central and northern Pennsylvania. 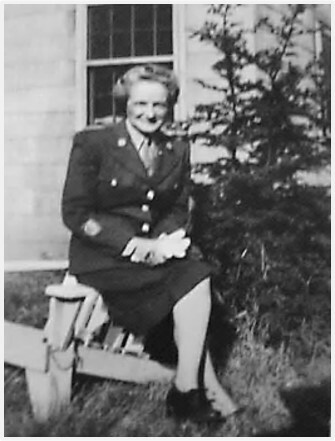 When she enlisted in the WACs she was living with her sister Ruth in northern Pennsylvania at Lawrenceville. After her enlistment she headed south to Fort Oglethorpe, Georgia for basic training. Aunt Marian had lived with her parents on the family farm near Montgomery Pennsylvania for most of her life. The executrix’s notice that was posted in the paper a year or so before this clipping indicated that Aunt Marian lived in Antes Fort after her father’s death (with a different sister—Martha). She apparently had moved from the home of one sister to the home of one sister to the home of another prior to enlisting. Fort Oglethorpe is located in the northwestern corner of Georgia near Chattanooga Tennessee. I think that trains generally transported troops during World War II, so Aunt Marian probably took a train the 800 miles or so from Pennsylvania to Georgia. 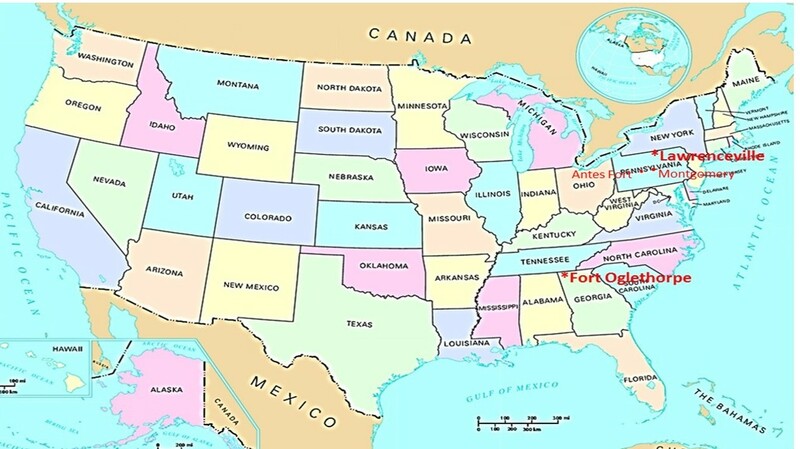 Was this the furthest Aunt Marian had ever been from her home state? Was she excited? . . . scared? . . . a little of both? I have no clue, but it seems like it would have taken a long time. I have no idea how fast passenger trains went back then. And, I wonder if it would have stopped at lots of small towns along the way. This all reinforces why you wanted to try and explore some of your great aunt’s life. How amazing for her to break free after such a ‘maiden’ aunt type existence – I don’t know about how Marian was feeling but I’m excited for her! I think it’s really awesome that she took her life in a totally new direction when she was in her mid-40s. Wow–what an amazing plunge for her to take! I’m not sure many women with her limited experience would’ve had the courage to do this! That’s what has really stood out for me, too. She had such limited education and background–yet somehow was able to embrace change and embark on a totally new adventure in her mid-forties. When I talk with relatives who remember her, it seems like her life started at 45. It may be that Marian enlisted not in spite of who she was, but because of who she was. I totally agree with your comment. I do not assume that she was uninteresting or uninvolved in life just because she lived on a farm or was not married. I wish a knew more about her life and personality when she was young. She must have always been a bit adventurous. You may be right–I wish that I could find information about what she was like prior to enlisting. I have a few official records of one sort or another–but so far I have nothing that really gives me clues about what she like was back then. Have you thought about getting a class roster from her school? Sometimes other people will be doing genealogy, or writing memoirs, and she could be mentioned in someone else’s postings. That’s a good idea. I don’t have much of a sense of how likely it is that records will still exist for a one-room school-house but they might. At my other blog, I was absolutely amazed that I someone found me who had the grade book from the small high school my grandmother attended. I definitely need to do more research into Montgomery, the town near where Aunt Marian grew up. So do I. So many people get into routines that they find hard to change by this age–whether they are working for them or not. Is the newspaper clipping from your collection? I wonder who saved it? Obviously a big deal if a family member saved the clipping! This clipping was not part of Aunt Marian’s memorabilia. I found it in a scrap book that my mother kept. Aunt Marian was an aunt of my mother’s. Your comment makes me curious about why my mother saved it. Must have been a huge adventure with all that entail emotionally. That’s what I’m also thinking. It had to have been very emotional for Aunt Marian. I also wonder what her siblings were thinking. Were they glad that she’d enlisted so that wouldn’t need to worry about her? . . . or it might have been the converse. . . they may have worried a lot about her joining. I suspect they were more likely worried about her joining than not. It can’t have been easy for them either. imagine the excitement mixed with nervousness! What an adventure … and one with the outcome not known. What a heroine! It had to have been an exhilarating time for her.